Yarn is used to make textiles using a variety of processes, including weaving, knitting, and felting. Nearly four billion pounds (1.8 billion kg) of weaving yarn, three billion pounds (1.4 kg) of machine knitting yarn, and one billion pounds (450 million kg) of carpet and rug yarn was produced in the United States during in 1995. The U.S. textile industry employs over 600,000 workers and consumes around 16 billion pounds (7 billion kg) of mill fiber per year, with industry profits estimated at $2.1 billion in 1996. Exports represent more than 11% of industry sales, approaching $7 billion. The apparel industry employs another one million workers. Natural fibers—cotton, flax, silk, and wool—represent the major fibers available to ancient civilizations. The earliest known samples of yarn and fabric of any kind were found near Robenhausen, Switzerland, where bundles of flax fibers and yarns and fragments of plain-weave linen fabric, were estimated to be about 7,000 years old. Cotton has also been cultivated and used to make fabrics for at least 7,000 years. It may have existed in Egypt as early as 12,000 B.C. Fragments of cotton fabrics have been found by archeologists in Mexico (from 3500 B.C. )., in India (3000 B.C. ), in Peru (2500 B.C. ), and in the southwestern United States (500 B.C. ). Cotton did not achieve commercial importance in Europe until after the colonization of the New World. Silk culture remained a specialty of the Chinese from its beginnings (2600 B.C. ) until the sixth century, when silkworms were first raised in the Byzantine Empire. Synthetic fibers did not appear until much later. The first synthetic, rayon, made from cotton or wood fibers, was developed in 1891, but not commercially produced until 1911. Almost a half a century later, nylon was invented, followed by the various forms of polyester. Synthetic fibers reduced the world demand for natural fibers and expanded applications. Until about 1300, yarn was spun on the spindle and whorl. A spindle is a rounded stick with tapered ends to which the fibers are attached and twisted; a whorl is a weight attached to the spindle that acts as a flywheel to keep the spindle rotating. The fibers were pulled by hand from a bundle of carded fibers tied to a stick called a distaff. In hand carding, fibers are placed between two boards covered with leather, through which protrude fine wire hooks that catch the fibers as one board is pulled gently across the other. The spindle, which hangs from the fibers, twists the fibers as it rotates downward, and spins a length of yarn as it pulls away from the fiber bundle. When the spindle reaches the floor, the spinner winds the yarn around the spindle to secure it and then starts the process again. This is continued until all of the fiber is spun or until the spindle is full. A major improvement was the spinning wheel, invented in India between 500 and 1000 A.D. and first used in Europe during the Middle Ages. A horizontally mounted spindle is connected to a large, hand-driven wheel by a circular band. The distaff is mounted at one end of the spinning wheel and the fiber is fed by hand to the spindle, which turns as the wheel turns. A component called the flyer twists the thread just before it is wound on a bobbin. The spindle and bobbin are attached to the wheel by separate parts, so that the bobbin turns more slowly than does the spindle. Thus, thread can be twisted and wound at the same time. About 150 years later, the Saxon wheel was introduced. Operated by a foot pedal, the Saxon wheel allowed both hands the freedom to work the fibers. A number of developments during the eighteenth century further mechanized the spinning process. In 1733, the flying shuttle was invented by John Kay, followed by Hargreaves' spinning jenny in 1766. The jenny featured a series of spindles set in a row, enabling one operator to produce large quantities of yarn. Several years later Richard Arkwright patented the spinning frame, a machine that used a series of rotating rollers to draw out the fibers. A decade later Samule Cromptons' mule machine was invented, which could spin any type of yarn in one continuous operation. The ring frame was invented in 1828 by the American John Thorp and is still widely used today. This system involves hundreds of spindles mounted vertically inside a metal ring. Many natural fibers are now spun by the open-end system, where the fibers are drawn by air into a rapidly rotating cup and pulled out on the other side as a finished yarn. About 15 different types of fibers are used to make yarn. These fibers fall into two categories, natural and synthetic. Natural fibers are those that are obtained from a plant or an animal and are mainly used in weaving textiles. The most abundant and commonly used plant fiber is cotton, gathered from the cotton boil or seed pod when it is mature. In fact, cotton is the best-selling fiber in America, outselling all synthetic fibers combined. Fibers taken from the plant leaf or stern are generally used for rope. Other plant fibers include acetate (made from wood pulp or cotton linters) and linen, made from flax, a vegetable fiber. Animal fibers include wool, made from sheep hair, and mohair, made from angora goats and rabbits. Silk is a protein extruded in long, continuous strands by the silkworm as it weaves its cocoon. Synthetic fibers are made by forcing a thick solution of polymerized chemicals through spinneret nozzles and hardening the resulting filament in a chemical bath. These include acrylic, nylon, polyester, polyolefin, rayon, spandex, and triacetate. Some of these fibers have similar characteristics to the natural fibers without the shrinkage problems. Other fibers have special properties for specific applications. For instance, spandex can be stretched over 500% without breaking. Fibers are shipped in bales, which are opened by hand or machine. The picker loosens and separates the lumps of fiber and also cleans the fiber if necessary. The carding machine separates the fibers and pulls them into somewhat parallel form. The thin web of fibers formed then passes through a funnel-shaped device that produces a ropelike strand of parallel fibers. Rollers elongate the strand, called a sliver, into a single more uniform strand that is given a small amount of twist and fed into large cans. There are three major spinning processes: cotton, worsted or long-staple, or wool. Synthetic staple fibers can be made with any of these processes. Since more yarn is produced with the cotton process than the other two, its manufacture is described below. 1 Fibers are shipped in bales, which are opened by hand or machine. Natural fibers may require cleaning, whereas synthetic fibers only require separating. The picker loosens and separates the lumps of fiber and also cleans the fiber if necessary. Blending of different staple fibers may be required for certain applications. Blending may be done during formation of the lap, during carding, or during drawing out. Quantities of each fiber are measured carefully and their proportions are consistently maintained. 2 The carding machine is set with hundreds of fine wires that separate the fibers and pull them into somewhat parallel form. A thin web of fiber is formed, and as it moves along, it passes through a funnel-shaped device that produces a ropelike strand of parallel fibers. Blending can take place by joining laps of different fibers. 3 When a smoother, finer yarn is required, fibers are subjected to a further paralleling method. 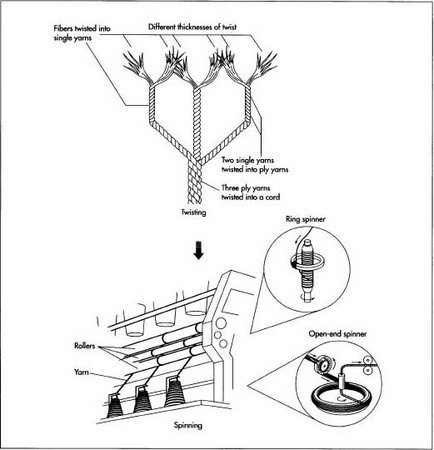 A comblike device arranges fibers into parallel form, with short fibers falling out of the strand. 4 After carding or combing, the fiber mass is referred to as the sliver. Several slivers are combined before this process. A series of rollers rotating at different rates of speed elongate the sliver into a single more uniform strand that is given a small amount of twist and fed into large cans. Carded slivers are drawn twice after carding. Combed slivers are drawn once before combing and twice more after combing. 5 The sliver is fed through a machine called the roving frame, where the strands of fiber are further elongated and given additional twist. These strands are called the roving. The sliver is fed through a machine called the roving frame, where the strands of fiber are further elongated and given additional twist. The predominant commercial systems of yarn formation are ring spinning and open-end spinning. Open-end spinning omits the roving step. and through the traveler. The traveler moves freely around the stationary ring at 4,000 to 12,000 revolutions per minute. The spindle turns the bobbin at a constant speed. This turning of the bobbin and the movement of the traveler twists and winds the yarn in one operation. 7 Open-end spinning omits the roving step. Instead, a sliver of fibers is fed into the spinner by a stream of air. The sliver is delivered to a rotary beater that separates the fibers into a thin stream that is carried into the rotor by a current of air through a tube or duct and is deposited in a V-shaped groove along the sides of the rotor. As the rotor turns, twist is produced. A constant stream of new fibers enters the rotor, is distributed in the groove, and is removed at the end of the formed yarn. Automation has made achieving quality easier, with electronics controlling operations, temperatures, speeds, twists, and efficiency. The American Society for Testing of Materials has also established standardized methods for determining such properties as drawforce, bulk, and shrinkage. Spinning systems and yarn manufacturing machinery will continue to become more automated and will be integrated as part of a manufacturing unit rather than as a separate process. Spinning machines have already been developed that combine carding and drawing functions. Production rates will increase by orders of magnitude as machines become available with even more spindles. Robot-controlled equipment will become standard. Domestic yarn producers will continue to be threatened by competition from Asian countries, as these countries continue to buy the latest textile machinery technology. Higher domestic material prices will not help, since the cost of the raw material can represent up to 73% of the total cost of producing the yarn. U.S. yarn producers will continue to form alliances with their customers and customers' customers to remain competitive. The textile industry is also forming unique partnerships. The American Textile Partnership is a collaborative research and development program among industry, government, and academia aimed at strengthening the competitiveness of the U.S. industry. Another continuing challenge for the industry will be compliance with stricter environmental regulations. Recycling is already an issue and processes are under development to manufacture yarn from scrap material, including denim. Yarn producers will have to incorporate pollution prevention measures to meet the air and water quality restrictions. Equipment manufactures will continue to play an important role in this endeavor. Genetic engineering will become more widely used for developing fibers with unique properties. Researchers have developed genetically-altered cotton plants, whose fibers are especially good at retaining warmth. Each fiber is a blend of normal cotton and small amounts of a natural plastic called polyhydroxybutyrate. It is predicted that dye-binding properties and greater stability will be possible with new fibers in the next generation. New synthetic fibers will also be developed that combine the best qualities of two different polymers. Some of these fibers will be produced through a chemical process, whereas others will be generated biologically by using yeast, bacteria, or fungi. Needles, H. L. Textile Fibers, Dyes, Finishes, and Processes. 1986. Clune, Ray. "AYSA head exhorts yarn spinners to take more proactive stance." Daily News Record, May 8, 1996, p. 9. Isaacs, McAllister. "Texturing gets automation as TYAA celebrates 20." Textile World, May 1992, p. 54. "Long-staple processing moves to cut costs." Textile World, September 1992, p. 42. Weiss, Rick. "Molecular biologists grow gene-altered cotton plants." Washington Post, November 12, 1996. Tortora, Phyllis G. "Making Fibers into Yarns." Understanding Textiles. Macmillan Publishing Company, 1987.